Sun Selector Clear Greenhouse Plastic Film, 6 mil, 4 year - Price Per Sq. Ft.
Glass has always been the standard material for greenhouses. With improved technology, there are many less expensive plastic alternatives. These coverings are available for both commercial and novice operations. Some of these plastics are translucent in order to diffuse light while others are clear allowing for complete light penetration. NOTE: The following installation instructions depict installing greenhouse plastic over a bare PVC frame. It is recommended that if a pvc frame is to be used that the PVC is first painted to avoid a mild chemical reaction that can occur when polyethylene is placed against PVC for a long period of time. This reaction can cause the film to degrade faster than normal. An excellent, lightweight option is a Polyethylene Film Polyethylene (PE) for your greenhouse. 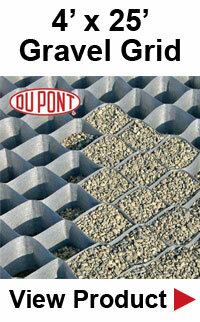 This product comes in rolls so you can just cut the material to the perfect fit for the greenhouse frame. This material also comes in various grades to suit how long you want the PE to last. A film used for only one year is the least expensive and is quite thin while a four year material is much thicker. As ultraviolet light will rapidly degrade polyethylene film, it is highly advisable you choose a film that is UV protected which is embedded into the material. You can also choose a film that offers chemical elements that will reduce the amount of moisture on the glass. Other films are capable of reflecting radiant heat back into the greenhouse, the same way as glass, allowing for a higher level of energy efficiency. Polyvinyl film (PVC) has many of the same qualities as polyethylene but is somewhat more expensive, having a life-span of 5 years. 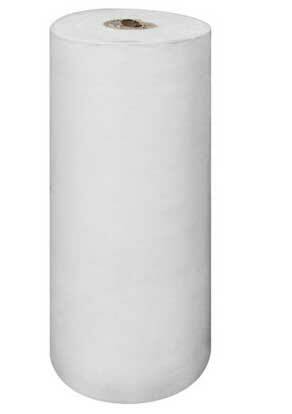 PVC film comes in sheets of 4 to 6 feet in width. The materials used to create this film will draw dust particles from the air and therefore will need to be rinsed occasionally, especially if you live in an area where it doesn't rain very often. Like polyethylene film, Polyvinyl is available with UV protection and also reduces moisture. Known as Double Walled Plastic, both of these films can be double layered over the frame of the greenhouse for a more durable exterior. Should you choose to use a double wall of plastic film, you will have to use a fan to blow air between the two layers to prevent them from sticking to each other. By installing a double layer, light transmission will be 77%, where a single layer of PE or PVC light transmission will increase to 85%. This film is in a very rigid format making it very easy to install onto the frame of your greenhouse. You can get this plastic either corrugated or with two smooth outer layers that house an inner corrugated material, similar to the construction of a cardboard box. Polycarbonate plastic allows a transmission of light up to 91% into your greenhouse. The downside to this material, the surface scratches easily, but the upside of this film - it's extremely durable, impact resistant and will last for 15 years. Installing plastic is one of the the least expensive alternatives for enclosing your greenhouse. Polyethylene (or poly) plastic is extremely durable, is opaque in quality and will cover the entire greenhouse roof, sides and end walls. If installed properly, you will remove any cold drafts while protecting your plants from extreme weather. Installation is normally attached to the structure's base frame. In order to install the plastics properly will take planning ahead of time to ensure the film's strength is not jeopardized. This can happen due to temperature changes or accidentally damaged by improper installation. Place your roll of plastic outside overnight, near the greenhouse. This allows the plastic to adjust to the temperature. You want to install the material in the cool morning hours. You do not want to try and install these films in hot weather as the material will expand in heat and then contract when it cools off causing the material to tear and become damaged. If your greenhouse is high, you will need a ladder. Get the assistance of a friend to hold the ladder, then roll the plastic across the roof. Next, roll the plastic down from the roof and across one of the sides lengthwise. After this step, the roof and one side of the greenhouse should be completely covered. Now pull the plastic all the way to the ground so it's taut at the end of the wall. Take a 1 x 3 wood strip (the length of the side) and wrap the excess film around it until taut, pressing against the frame. Then nail the board along the entire side of the greenhouse. Go to the other side of the greenhouse, cut off excessive Polyethylene, leaving 12 to 18 inches to spare. Pull the plastic down to the ground until taut, following the same procedures as above. If you prefer, instead of wrapping the material around your wooden strip, you can pull the plastic taut, press the 1 x 3 wooden strip against the frame, nail in place and then cut any excess for a clean, neat appearance. 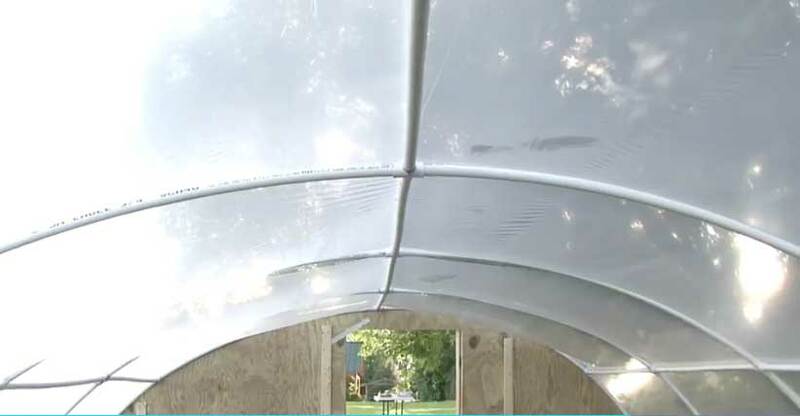 Simply roll the Polyethylene from one side, over the roof and down on the other side. You will probably need someone to assist you in this process. 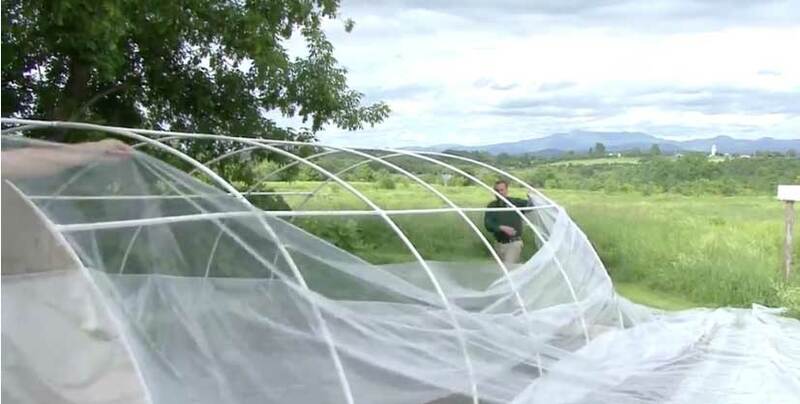 Then follow the steps for securing the plastic to the greenhouse frame. The entire structure should be enclosed with the film and secured in place with the wooden strips. 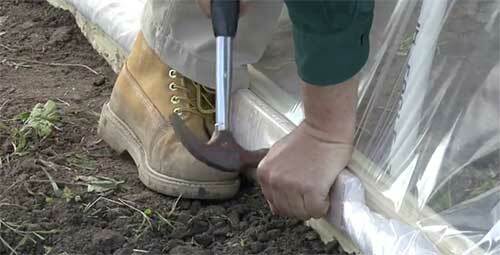 Using shorter strips, secure the material to the back and front of the greenhouse. If you would like the option to remove the plastic, at some point, you might want to use locking channels to hold the plastic in place. These locking mechanisms will allow you to easily detach them while maintaining the plastic's structural stability. DO NOT install plastic on a windy day. One, the film will not stay in place and two, you could easily hurt yourself while on the roof! I hope this information will help you install an excellent film solution for your greenhouse. Should you believe it might be a little difficult to achieve, hire a professional to do it for you. You do not want to damage the material or harm yourself in the process. So, when in doubt, hire someone to do it for you.